We are more than happy to create a custom T-Shirt or Memory quilt for you, but for any number of reasons you need some help getting yours completed. We might ask you to tell us the story behind the quilt, but we won't judge. Some quilts just need a border or squaring up to get the edges straight. It is amazing how some professional machine quilting will turn a crumpled mess into a beautiful keepsake you will treasure for many many years. Whatever the reason that you started this project and don't feel you can not continue. Contact us. Take a quick photo of what you are working on, and we can give you a pretty good idea if we can help you finish it up. In over 15 years of quilting for others, we have only had a few that we couldn't work with. We aren't prejudiced as to what method you used to create your quilt top. Let us know what you would like for us to do. Of course, as always, if you are in the area, you can come by the shop and we will take a look. but if you are mailing in the quilt top or quilt project, send us a photo so we can evaluate the project. Just recently, we had the first quilt we had to turn down. She shall remain anonymous, however, I did take a picture of how thick the batting was. She did a great job piecing the top, but went all wrong after that. The batting was a thick upholstery batting along with the fleece on the back made it so thick that we literally could not get it under our quilting foot on the longarm quilting machine. 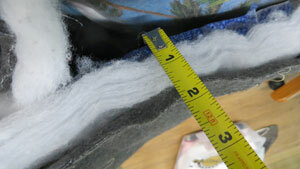 It was nearly 2 inches thick! Most everyone that sends us their project will indicate that it is time to let the professionals take over. That's what we are. Professionals. We have literally made thousands of tshirt quilts. That's 40,000 - 50,000 t-shirts in the last couple of years. We have seen it all. The most problematic projects are when the maker 'gets innovative' in making their tshirts 'work' into the top. Let us take the stress out of your t-shirt quilt project. 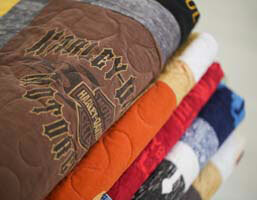 Either take a look at some of tshirt quilt tutorials, or send it to us to complete. Here is a short list of articles that might be of interest. So, whether you have just the tshirts, blocks, or the top already completed. Our quilt finishing service return a completed quilt that you will treasure for a lifetime.